December - Having read the log for this time last year we realise that the wheel of time just keeps turning and what we experience this year is not unique and we went through the whole process in December 2003. The Christmas present rush for both of us didn't really start until mid month and was less frantic than previous years. We and our friends are sufficiently content with out lives and if we need something then we'll go and buy it so Christmas comes all the year for us. Jane went to her surgery Christmas dinner at the Westone Hotel and had a chance to bop at the disco which made her night. We enjoyed the first Bridget Jones film and sequels tend to be a bit of a disappointment but this was really very funny. It had the usual jokes and love triangle but the actors carried the whole film brilliantly. Jane has always had a desire to see the recording of BBC Radio 4s "Just a Minute" and so after our trip to Hull to see "I'm sorry I haven't a Clue" she rang the BBC to see when they were next recording. It turned out that they had tickets for a Friday evening in the early part of this month so we invited Nick & Val to join us. We took the afternoon off work, caught a train down to London, had a meal at the Tate Modern restaurant and then headed off for the Mermaid Theatre. As it happened we were walking past a Star Bucks only to see Nick & Val sitting at a window seat drinking large mugs of coffee. We joined them for a warm drink before queuing up outside the theatre. We managed to get into superb seats 3 rows from the front and were very close to the players: Ross Noble, Paul Merton, Sue Perkins and Graham Norton with the inimitable Nicholas Parsons in the chair. We couldn't have asked for a better evening. It was very amusing. For anyone interested you can learn more at the BBC Radio 4 web site. The film Enduring Love is based on the Ian McEwan bestseller and the main reason we went to see it is because it starts with a hot-air balloon accident and we were intrigued to see how realistically it was done. The balloon sequence was very good and the accident was quite shocking. The rest of the story was an intriguing psychological thriller with an every day feel to it. A man stalking another man because he is in love is an unusual storyline. We've heard that the film differs significantly from the book but we enjoyed it. Eventually Christmas Day arrived. Jane had collected her mother from Barnet on Thursday before and we had completed all the shopping in plenty of time. We had invited Sue & Graham and Nick & Val for dinner and as can be seen from the photo we had a great time with plenty to eat and drink without over doing it. We spent the evening watching Harry Potter and then attempting some quizzes. Our friends and relatives did us proud with presents that will be useful for a long time to come and Jane made sure everyone was thanked with a phone call or an email. She made contact with friends and relatives all around the world. We both returned to work between Christmas and New Year. 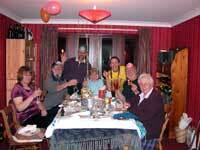 On New Year's eve we went to Nick & Val's, joining the usual suspects for a meal and to see the midnight hour. We played Pictionary after dinner and before we knew what was happening it was five to twelve and Nick was popping the cork on a very good bottle of fizzy wine - toasts to absent friends, happy 2005 and cuddles all round before watching Jools Holland do his stuff for an hour on TV - a perfect start to another promising year. Steve hasn't played computer games for nearly ten years, Doom being his last passion on a Windows 95 PC but he had read such rave reviews about HalfLife2 he put it on his Wish List for Santa to deliver. Thankfully he got what he asked for with a little help from Jane, he would've been unbearable to live with if it hadn't been under the tree. It took some setting up because, once installed, the game has to be started on-line, saved and then it can be played off-line.